We are pleased to invite you to the training at our Academy. We offer classes for different groups from the printing industry. The subject of training applies to the different stages of production (prepress, press, postpress) and covers a range of issues, from color management and preparation of graphic works through screening techniques, profiling, proofing to the techniques of control and measurement of printing, types of substrates and ways of protection and refinement. The aim of the lectures within the Academy, carried out by employees of our company and external experts is to widen the knowledge of the issues that you are dealing with every day at your work. We hope that our Academy will become a forum that will support you in the improvement of your products and improve cooperation. There is a registration fee to participate in Academy. We provide training room, materials and coffee & lunch breaks. Participants shall organize and cover the costs associated with travel and accommodation. Topic: “plates photopolymers Paint Graphic – production, types and application” – a flexible substrate. Basic Training and Advanced Training for all concerned. Topic: “photopolymer plates, inks Graphic Design, Dies – parameters important for the preparation of print” – rigid substrates. Topic: “photopolymer plates, inks Graphic Design, Dies – production, types and application” – Training for employees of the side and the sales force. 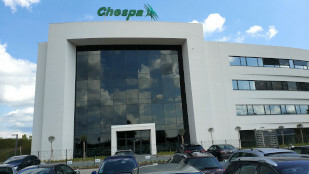 Headquarters Chespa sp. z o. o.